The history of the Mille Miglia and the history of the BMW brand have been inseparably connected for decades. The roots of this relationship were formed during the classical road races between 1927 and 1957 and the tradition is still alive today in the annual races for historic vehicles. With the Mille Miglia 2006, the BMW Group Mobile Tradition, the Munich automobile manufacturer’s division for classics is also using a series of vehicles that set new standards in the art of engineering in their time and that are now considered milestones in the history of the development of automotive engineering. Furthermore, at the start and finish line in Brescia in northern Italy, BMW is presenting a unique specimen fabricated on the occasion of the Mille Miglia 2006, in which the enthusiasm for racing sports from days past is being united with the technical opportunities of today, along with pioneering design perspectives. The BMW Concept Coupe Mille Miglia 2006 pays homage to the skills, successes and the visions of the motor sports pioneers of the past, created by its modern successors. On the surface, the BMW Concept Coupe unmistakably bears the traits of a racing sports icon. Its bodywork design is oriented on the BMW 328 Mille Miglia Touring Coupe, that legendary two-seater with which Fritz Huschke von Hanstein and Walter Baumer drove home the victory during the Mille Miglia in 1940. Their speed record – average speed: 166.7 km/h – has remained until today. No other Mille Miglia victor – neither before nor since – ever travelled as fast as the BMW 328 Mille Miglia Coupe with its touring body, which was driven by the legendary “racing baron”. Up until into the 50’s, the BMW 328 was still victorious in international racing sports. It was one of the most successful competitive vehicles in the long BMW motor sports history. On top of that, in 2004 it wrote Mille Miglia history for a second time. The BMW 328 Mille Miglia Touring Coupe was the first automobile ever to win the historic remake of the Mille Miglia after winning the classical race. With the BMW Concept Coupe, the automobile developers at the Munich manufacturer are erecting a monument to their predecessors. The study, both optically and technically fascinating, is a symbol of how much the values internalised by the creators of the BMW 328 still determine the work of the engineers today. Just like back then when enthusiasm, the will to win and the willingness to travel new paths led to convincing success during the Mille Miglia, these motives are also the prevailing drive for creating constantly improved automobiles today. The Mille Miglia has lost none of its fascination, also as a bridge between the traditional and modern automobile age. The once toughest and up to today most legendary automobile road race in the world attracts umpteen thousands of motor sports fans to northern Italy year for year. In the towns and cities along the route between Brescia and Rome, they celebrate automobile history in its most exclusive form. That which began in 1927 as a long-distance race over 1,600 kilometres – or put better: 1,000 miles – has been being held since 1977 over the same distance as a consistency test for historic vehicles. Only those vehicle models are allowed to take part that were already at the start during the classical races. Thus, the Mille Miglia unifies past and present in a worldwide unique event for automobile enthusiasts. In 2006, classical motor sport meets up with practiced tradition at eye level for the first time. 24 long-distance races were driven in northern Italy between 1927 and 1957; the new version will be held for the 24th time. 375 vehicles have been approved to start in the Mille Miglia 2006; 22 of them bear the white-blue BMW logo. Preserving the automobile tradition plays an important role at BMW. Successful models from back then continually deliver inspirations for modern vehicle concepts. Adhering to indispensable values such as sportiness, efficiency and shear driving pleasure yield an orientation for the path into a successful future. The Mobile Tradition in the BMW Group has therefore made its mission grooming, securing and keeping alive the history of the brand and the vehicles with which it is associated. Since 1994, all BMW Group activities are being coordinated with that which is associated with the history. The Mobile Tradition is the soul and memory of the enterprise and preserver of its history, its brands and its products. The BMW Concept Coupe Mille Miglia 2006 will never win a race but the two-seater is still a symbol for motor sports, racing success and the brand and spirit that have moved the engineers and drivers to perennially great achievements for decades. With its unique concept study, the developers and designers in the BMW Group are showing how traditional values, modern expertise and visions can be unified into a fascinating vehicle. 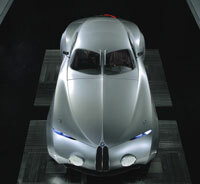 The past, present and future of automobile engineering are concentrated in the Concept Coupe Mille Miglia 2006. The study documents what it means for an automobile manufacturer to reflect on its historical strengths, to take advantage of current technical competency and to open up tomorrow’s opportunities already today. The Concept Coupe Mille Miglia 2006 is neither a copy of a successful racing car nor is it being used as a herald for future series models. Rather, the two-seater pays homage to the outstanding achievements of those engineers who helped BMW gain a leading position in racing sports and in automobile engineering decades ago. In a time when the competence of a manufacturer was much more tightly woven with racing sports, vehicles arose that continue to serve as milestones for technical progress, even today. The principles that led to victory back then have not lost any of their validity. They are still the drive to construct especially dynamic, attractive and successful automobiles. The Concept Coupe points out these parallels and, moreover, elucidates that the traditional values will continue to last into the future. Sportsmanlike ambition, the will to win and creativity secured the BMW 328 Coupe success during the Mille Miglia 1940. Its creators used the most progressive automobile engineering methods of the time in an intelligent manner to win the toughest and most prestigious road race in the world. The two-seater was given a lightweight chassis manufactured in the Milanese bodywork forgery Touring on a lattice frame. The power delivered by its 2.0-litre six-cylinder in-line engine was increased from originally 80 to 136 PS. At the finish, the BMW 328 Mille Miglia Touring Coupe with Fritz Huschke von Hanstein and Walter Baumer went through the finish line as the victor – more than a quarter of an hour in front of the second place car. The character of the BMW 328 and its successes have stood the test of time. After all, the speed record with an average speed of 166.7 km/h has never been broken. And its fundamental properties – impressive engine power, high efficiency, lightweight and optimal aerodynamics – still continue to offer a promising recipe, and not only in motor sports. All that is reason enough to erect a monument to the BMW 328 and its creators. The two-seater was not only the brainchild for the design of the BMW Concept Coupe; it also supplied the inspiration for the study’s inherent notion of heritage. From the long engine bonnet and the generously sweeping front wheel housings through the strongly recessed greenhouse with its divided windscreen up to the wings that arch over the rear wheels covering them completely: the streamlined body of the racing sport legend has been completely reabsorbed in the BMW Concept Coupe. But at the same time, the characteristic basic design is being interpreted in a modern manner. The aerodynamics, already distinctive in the 1940 Mille Miglia winner was improved even further. The insights about airflow and its influence on the vehicle’s uplift pressure and downforce gained in the meantime have also opened up new opportunities. While optimising the aerodynamics, the body designers now especially concentrate on the side and rear sections of the vehicle. The goal is to conduct the airflow in perfect harmony and turbulence-free up to the tail. A defined flow separation was to be created only there. Simultaneously, not only is the aerodynamic drag effectively reduced but greater uplift is generated at the same time, improving road holding and thus the Coupe’s driving dynamics. Five each optically impressive air intakes near the A-pillars also control the flow movements in the front end. These gills are a venerable element typical for sports cars and are being fostered by BMW in current models also. In the BMW Concept Coupe, these ports, arranged in a very slim Z-line, fulfil a two-fold function. On the one hand, they lead off the air used for engine cooling back out through the BMW kidney. In addition, under pressure is generated in the front wheelhouses at the same time. This effect reduces the turbulences at the wheel housings and simultaneously amplifies the vehicle’s contact pressure with the road. The entire trim over the rear wheels and the extremely gently coasting tail are additional design elements based on both the traditional and the latest aerodynamic findings. A reverse V-form thus arises as the sum total, minimizing undesired turbulences and concentrating the flow separation to a tightly restricted area. Trimmings placed on the underbody and diffusers made of carbon on the front and rear aprons also ensure defined air conductance in those parts of the body that are not openly seen. In the body design, the functions needed for positioning the engine, drive units and passenger sections are combined into an aesthetic whole together with the aerodynamic requirements. At the very first glance, the BMW Concept Coupe impresses as a highly dynamic driving machine. The special appeal of the two-seater grows out of this purposeful appearance. The 20-inch alloy wheels, specifically developed for the BMW Concept Coupe, fit into the image of its powerful proportions. Tires dimensioned 245/40 R 20 are mounted on them. Instead of doors, the study bears permanently integrated sidewalls, contributing to weight reduction on the one hand and to increasing torsional stiffness on the other. To let the pilot access the interior, the entire cockpit swings up. The rear section of the concept study is also distinguished through design elements in which the aesthetics are tightly connected with their function. The headlight panel, made from LED elements is likewise conducted in a gentle Z-curve horizontally over the tail. The combination of the most modern illumination engineering and their unusual design unites two functional advantages: due to the extremely fast response time of the LED’s and through the increased conspicuousness of their asymmetrical layout, the brake lights can be perceived earlier than with conventional lighting. The BMW Concept Coupe does not deny its inspirational source. Still, its body form is not dictated by nostalgia, but rather by the endeavor for forward-looking interpretations for typical BMW design themes. The study is proof that the vehicle designers at BMW have a grip on the art of accepting traditional impulses and letting them flow into new designs with the help of modern expertise. That is the only way that concepts can mature – by combining the power of history with the fascination of visions and letting emotions be awakened at the same time. While developing the BMW Concept Coupe, traditional methods were applied, which continue to be an essential component of the design process for the BMW Group even today. Emotional models based on emotional designs emerge from the hands of experienced modellers. Whereas the nearly unlimited possibilities of high-tech designing on a computer always involve the danger of randomness, in traditional body design only consequent implementation of an idea leads to the desired goal. That is also a reason that the design models for all BMW Group models emerge made-by-hand even today. During series development, this is done with clay models – a malleable Plasticine mass. For the Concept Coupe, the designers fell back on even more traditional methods: modeling with plaster. This material entails fixed work rhythms during the application, shaping and hardening of the material. Each and every step demands a high degree of concentration. During both of these optically and haptically tangible processes of evolution, the designers form an especially tight relationship to their design object. One can understand how – and perhaps also why – the body designers of past generations were able to create true icons of sports car construction even without the availability of digital design. During the material selection, the developers of the BMW Concept Coupe gave themselves the same task that inspired the creators of the BMW 328 Mille Miglia Touring Coupe to unconventional solutions. An extremely light chassis should emerge – from the available materials best suited to this purpose. At Touring in Milan, an aluminum shell was stretched over a lattice frame to accomplish that. Nowadays plastics developed especially for chassis construction set the standard for lightness, load ratings and design freedom. Accordingly, that kind of material was chosen for the Concept Coupe. The BMW Concept Coupe unifies the best of two worlds – and even more. Its design provides hints of design and function opportunities, which can be made practical for series production vehicles used only in the far future. These visions are already fascinating today. For example, the front of the Concept Coupe ensures a striking appearance in a completely new manner, but especially guarantees better vision. At first glance the “face” of the study appears familiar, its “eyes” remind one of the circular headlamp used in the BMW 328. But they are not integrated into the chassis – rather they have been attached as flat elements. Modern LED technology facilitates accommodating powerful light sources in comparatively small units. This progress provides the designs with new possibilities. The forms and linework from the engine hood to the wheelhouses in the Concept Coupe can be continued up through the front apron without being interrupted by the headlight units. The optically dominating role on the front end is taken over by the BMW kidney. More than ever, it characterises the typical BMW “face” by letting the headlights take over the role of the “eye”, despite the innovative execution. Modern influences dominate the appearance of the Concept Coupe at other points also; the latest series technology is used under the timeless sheath of the study: the drive components in the BMW Z4 M Coupe, the most powerful version of the purist-sporty two-seater. The engine and suspension in the uncompromising sports car are given a totally new calling in the BMW Concept Coupe. They create the ideal basis for outstanding dynamics, for which the Concept Coupe must distinguish itself, as if it were conceived for driving on the road – or a racetrack. And, even though this idea remains purely theoretical, the relationship of traditional heritage and modern technology in this form makes complete sense. The BMW Z4 M Coupe is standing at the temporary end of a long family history of sports cars from BMW. Powerful engines, high efficiency, intelligent lightweight construction, aerodynamic shaping and enthusiastic design lend it its individual character. The BMW Concept Coupe surmounts the BMW Z4 M Coupe by 23 centimetres length. Furthermore, it is 14 centimetres wider but 4 centimetres flatter than its counterpart approved for road traffic. The extremely short front body overhang is especially noticeable. On the other hand, the tail section is markedly gentle and stretched wide for aerodynamic reasons. The BMW Concept Coupe is seeking company with the BMW 328 and BMW Z4 M Coupe. And is exhibiting the common ground between the classic role model and its modern heir at the same time. Initially, the BMW 328 was conceived as an open two-seater. Only when the regulations of the 24-hour race in Le Mans also permitted closed vehicles was the order for the BMW 328 awarded: to design a suitable, light-as-possible and aerodynamic body. The modern development process for the BMW Z4 Coupe had a similar character. The BMW Z4 Roadster had already been established and was already successful when the body for the closed-in sister model was completely revamped. On top of that, the BMW Concept Coupe provokes one to intensively delve into the history of engine construction. The study used a six-cylinder in-line powerplant as the power source. That was already the case in the BMW 328; that’s the case in the BMW Z4 M Coupe also. Six cylinders arranged in line were and are the ideal pattern for successful propulsion. More than 70 years of the history of the development of the six-cylinder in-line engine are reflected in the Concept Coupe – a slice of history where the opening chapter is just as fascinating as the certainly only temporary ending. That they let the 1971 cubic centimetre BMW 328 engine be strengthened from originally 80 to up to 136 PS is something that is still seen as proof of the excellent skills of the BMW engineers of yore. Both the cylinder capacity as well as the power-to-weight-ratio in the BMW 328 Mille Miglia Touring Coupe marked best values and provided an impressive proof of BMW’s engine competence. Nowadays, much higher demands are made on the efficiency and effectiveness of engines. But BMW continues to set the landmarks for that which is technically feasible. The exceptionally high performance of the six-cylinder in-line engine in the BMW Z4 M Coupe now draws its power from a displacement of 3, 246 cubic centimetres; its power is rated at 252 kW/343 PS. When compared to its forefathers, the fuel consumption for the 2.0 litres of displacement is meanwhile actually lower. Regardless how much the requirements and technical opportunities have transformed, the six-cylinder in-line engine from BMW and BMW M has remained the benchmark of its time. The modern power unit in the BMW Concept Coupe displays its advantage very impressively; also acoustically. Modifications made to the intake and exhaust system give the concept vehicle an engine sound uncompromisingly attuned to racing sports tonality. A muffled rumble in idle already signals that kind of expectant impatience that the BMW Concept Coupe would also radiate optically at the starting line of a racetrack. At 4,900 rpm, exactly the engine speed where the maximum torque of 365 Newton metres is reached, the powerful-raw timbre of the six-cylinder has already intensified to a fanfare-like sound experience. The driver’s and his co-pilot’s surroundings are also much different from everything that sports car enthusiasts were used to up to now. Completely free of the conventions that arise during series-ripe concept studies, the designers helped the BMW Concept Coupe to an incomparable interior. Limits on the functionality, the material selection and both the optical and haptic impression valid until now were consciously burst through; customary design and fabrication techniques were replaced by completely new methods. Thus an interior was born in which the structure of the surfaces and forms achieve totally new effects. At the same time, gaps and contours have their own functionality; metal plied by hand impressively accentuates the characteristics of the material. All surfaces are brought out uninterrupted and unadorned. Neither decorating trim nor rings or frames impair their purist impression. Even letterings, logos and symbols are not, for instance, additionally attached but are embossed into the respective metal component using laser technology. Using extra-flat rolled stainless steel, untreated cowhides and Lycra fabric, a total of exactly three materials are deployed in the interior of the BMW Concept Coupe. The processing methods were also reduced to a minimum selection. All components were either stitched together or clamped to each other using a special technique. The impression of surfaces and controls resulting from this imparts the occupants an impression of ambience that is just as futuristic as exclusive. Everywhere where two metal components meet, they are clamped together absolutely flush using laser cut castellations. Gaps are only present where they could and above all should take on a function at the same time; for instance, the transition between the dashboard support and the centre console is used as additional storage space. That transforms the gap from an undesirable side effect accruing when two components are connected into a consciously inserted design element. That is another way in which the interior of the BMW Concept Coupe opens up entirely new perspectives in automobile engineering. Connecting tradition with innovation also led to a new aesthetic when processing the leather in the BMW Concept Coupe interior. Several layers of the merely tanned, but other than that natural cowhides are pressed into each other. Thus a three dimensional leather-mould part emerges that, among other things, imparts a new haptic feeling in the seating and middle console sections. Furthermore, the undyed leather underlies a natural maturing process, leading to attractive patina effects over the years. That is the continuation of the interior that the BMW Concept Coupe already expresses with its body design. Classical values gain a fascinating attraction when they are interpreted in new ways. Pioneering concepts do not emerge just from up to date expertise but also require an awareness of historic roots. The BMW Concept Coupe shows what opportunities arise from that. This unique vehicle could only have been built by automobile developers who groom traditions based on their convictions, purposefully use their competence and who are open to new visions in all areas. The name is the programme and it has a legendary sound: Mille Miglia. Right from its inception, the road race covering 1,000 miles was considered the greatest challenge imaginable for the race drivers and their automobiles. Those who could pass the Mille Miglia had thus proven their ability to compete not only in motor sports but also all-together in automobile construction. 24 races were held between 1927 and 1957 in northern Italy. The races were a spectacular event for umpteen thousands of motor sports fans and a great stage for race drivers such as Tazio Nuvolari, Stirling Moss, Rudolf Caracciola, Juan Manuel Fangio and Fritz Huschke von Hanstein. On top of everything, the Mille Miglia was always the most important trial of strength for the automobile manufacturers. In 1977, the Mille Miglia celebrated its resurrection. As a reliability and constancy drive for historic vehicles, it has held the spirit of classical racing sports alive since then. Four young men from Brescia, just as wealthy as they were excited by racing sports, had already made a determination in 1925 to turn their hometown into a motor sports centre. Two years later, they were able to see their plans come true. Henceforth, the start and finish line in Brescia became a real carnival; the drivers and their automobiles were enthusiastically celebrated. Year for year, racing sports fever spread throughout the land and not only because the cars dominating the races were initially of Italian manufacture. The first Mille Miglia led through Bologna and Florence to Rome and from there through Ancona, Ferrara, Treviso and Vicenza back to Brescia. The races also ran in the subsequent years on earth roads and through tight villages. It put people and material through a tough test and exuded the incomparable atmosphere of a spectacle in which not only the drivers were constantly driven to their limits. What the critics were worried about actually happened during the race in 1938: ten people died during a terrible accident near Bologna. The tragedy instigated the Italian government to immediately prohibit racing sports events on public roads. Only two years later, the substitute for the rally was found: the 1st Gran Premio Brescia delle Mille Miglia. The course once again covered 1,000 miles but now on paved roads in the city triangle between Brescia, Cremona and Mantua. This course was driven nine times. The spectators not only had to get accustomed to a new route but also to a totally new kind of victorious car. For years and years, the eight cylinder bolides from Alfa Romeo with its up to 360 PS powerful compressor engines had dominated the Mille Miglia. Only in 1931 did Rudolf Caracciola manage to break through this Italian winning series, using a powerful compressor-Mercedes SSKL. But a new kind of sports car suddenly appeared on Europe’s racing circuits: the BMW 328 – actually a delicate vehicle when compared to its competitors with its 2 litre engine and a stock power of a modest 80 PS. The small two-litre class roadster had already won the Mille Miglia back in 1938. BMW had thus made a breakthrough, but the really great triumph followed in 1940. In their BMW 328 Mille Miglia Coupe with a Touring body, Fritz Huschke von Hanstein and Walter Baumer drove to a historic victory. Driving at an average speed of 166.7 km/h, they set a record that would last for all time. The second place car, an Alfa Romeo, only reached the finish line a quarter hour after the victorious BMW 328. For BMW at the same time, the spectacular success was to remain the only total victory in the classical race. The Second World War initally put an end not only to the Mille Miglia but also to BMW’s motor racing activities. With the restart in 1947, the Mille Miglia led from Brescia to Rome and back for the first time again. After the prelude victory for Alfa Romeo, Ferrari took over the dominating role in the subsequent years. After the war, BMW no longer sent factory teams to Italy. And despite some spectacular races – such as in 1955 with the Stirling Moss and David Jenkinson victory in a Mercedes 300 SLR – the end of the Mille Miglia was only a question of time. The field of participants became increasingly confusing; occasionally there were over 400 vehicles at the start line even including diesel vehicles and oddities such as the ISO tiny car – the predecessor of the BMW Isetta –, which bravely tormented themselves over the Apennines passes in 1954. But above all, driving on the roads and arriving safely at the finish line became increasingly riskier in the race cars that became more powerful and faster from year to year. The tragedy of 1938 repeated itself in 1957 – a serious accident in Guidizzolo claimed twelve fatalities – and spelled out the end for the Mille Miglia. The fascinating moments of the Mille Miglia remain stuck in the memories of many automobile enthusiasts. And they can be experienced once again today in the Mille Miglia storica. In 1977, exactly a half century after the first Mille Miglia, a new version of the legendary race was staged for the first time. Meanwhile, it is completed year for year in May in historic sites as a reliability and consistency run. The chase for best times has turned into a demonstration of automobile-engineering art stretching over three days and attracting hundreds of thousands of spectators to the roadsides. All vehicle models that participated in the classic Mille Miglia at least once between 1927 and 1957 are permitted to start. Of course, the BMW 328 and other vehicles such as the BMW Isetta and BMW 507, two models deployed in the 50’s in private races, also take part. Each year, the BMW Group Mobile Tradition brings a series of vehicles from their stock to the Mille Miglia start line. On top of that, private teams always secure their participation in the legendary circuit. For fans of classical automobiles, today the Mille Miglia has an importance comparable to the significance of the original races for the motor sports scene back then. Nowhere other than between Brescia and Rome is motor sport and automobile engineering history celebrated so intensely and impressively. The Mille Miglia storica pays homage to the design engineers and their works, which continue to inspire professionals and lay persons even today. In 2006, it will be held for the 24th time. That means exactly the number of races will be reached that were held between 1927 and 1957 during the fights for minutes and seconds. The places in the starting field are still just as coveted as back then. As not only the memories but above all the vehicles allowed to participate are lovingly groomed by their owners – nothing stands in the way of the future of the Mille Miglia storica. Agility, acceleration ability, reliability and lightness. The constructors of the BMW 328 concentrated on the essential and thus opened up a new era in motor sports. At a time when highly tuned compressor racers dominated the racing scene, the merely 830 kilogramme and, in the series version only 80 PS powerful BMW 328 Roadster was a sensation. Because it put the large, powerful and heavy competitors way behind, thus becoming the forerunner of modern motor sports in which only the connection of power with maximum efficiency leads to success. 70 years ago, on 14 June 1936, the BMW 328 with the legendary Ernst Henne at the wheel won its first race, on the Nurburgring. More than 200 additional victories were to follow up into the 50’s – a success story that was unique up to then for a vehicle of this class. Hardly any other model has distinguished a company in motor sporting history as the BMW 328 with its 2-litre six-cylinder in-line engine. The BMW Group Mobile Tradition has groomed this legend up to today with special devotion: not only in its workshops and exhibition halls but regularly also with appearances at historic races, where the BMW 328 as a roadster as well as in the Coupe style still continues to attract admiring looks from automobile lovers. The BMW 328 Mille Miglia Touring Coupe has won a place of honour in the collection since 2002. Fritz Huschke von Hanstein and Walter Baumer won the Mille Miglia with this vehicle in 1940. Motor sports have set the tone of BMW’s history right from the start. Following the great successes on two wheels, the constructors were able to get an early start on ensuring attention during automobile races. The very first entry during the alpine route in 1929 ended with a convincing team victory for Max Buchner, Albert Kandt and Wilhelm Wagner in their BMW 3/15 PS, powered by a four-cylinder engine. Numerous victories after that quickly let the brand become well-known, so four years later the thrust into the six-cylinder class was watched with excitement. The new six-cylinder in-line engine proved its predestination for motor sports with its performance and revving ability, its slight weight and its reliability. Accompanied by additional racing victories, the power of this machine grew until 1934 to 55 PS with its displacement expanded in the meantime from 1.5 to 1.9 liters. The BMW 319/1 Roadster equipped with this engine won, among others, the 1936 alpine circuit. But during the triangle race in Munich it was relegated to second place: by a BMW 328, the brand’s new sports car, which thus dethroned its predecessor and started an unprecedented string of victories. Already in June of 1936, Ernst Henne clearly won the Eiffel race in the Nurburgring with this totally new design of a two-seater. Another 130 victories came on top of that up to 1940. With a top speed of 150 km/h, the BMW 328 already advanced to the second fastest car in Germany in 1936, following the Mercedes compressor model. But things didn’t stop there. The engine power quickly grew to over 100 PS. As special racing fuel finally became available, the six-cylinder in-line engine even managed to produce 136 PS. As far back as 1938, the BMW 328 was able to make its first glittering appearance during the Mille Miglia. The two-seater roadster took first place in the two-litre class. The climax followed in 1940: during the first and only Mille Miglia to take place on a high-speed course, “racing baron” Fritz Huschke von Hanstein and his co-pilot Walter Baumer secured total victory with more than a quarter hour lead. Their car reached a top speed of 220 km/h. With an average speed of 166.7 km/h, the Mille Miglia victor set a record that has remained ever since. Huschke von Hanstein and Baumer won their spectacular victory in a very special BMW 328. Both the open two-seater and the closed variation, initially fabricated in Munich, impressed through their advantageous performance weight. But an even lighter Coupe was needed for the race in Le Mans in 1939 and Brescia in 1940. The order was awarded to the Milan bodywork forgery Touring. Of all companies, it was the “house tailor” of the largest competitor of back then, Alfa Romeo, and they gave the small BMW an aluminum body which turned out to be just as streamlined as it was light. A victorious automobile was born. With its lattice frames and the “superleggera” chassis, the ready-to-drive Coupe weighed a mere 780 kilograms. The victory run during the Mille Miglia was to temporarily remain the last public appearance of the Touring Coupe. The traces of the vehicle were initially lost in the war confusion of the subsequent years. In 1945, the BMW re-emerged. The former BMW engineer Claus von Rucker discovered a badly demolished Coupe after an accident. He managed to acquire the car from the US occupation forces and to rebuild it. At the end of 1947, von Rucker emigrated to Canada, where he sold the BMW 328 to the photographer and race driver Robert Grier. Grier drove several races with the Coupe and following his death in the middle of the 50’s the BMW stayed hidden in a garage for about 30 years in the small town of Wallingford/Connecticut. It was only in the middle of the 80’s that the Californian collector Jim Proffit’s attention was drawn to the rarity. After intensive restoration, Proffit participated in several historic car races with the BMW. Already back then, he made the determination to return the only car of its time back to Germany. Things progressed that far in 2002: after long negotiations, Proffit and the BMW Group Mobile Tradition agreed to transfer the Coupe to Munich. The BMW 328 Mille Miglia Touring Coupe is now a showpiece in the Mobile Tradition collection. Between 1936 and the summer of 1940, 464 type BMW 328 vehicles emerged. Many of them are still being used in historic races. The BMW Group Mobile Tradition also regularly takes the vehicles in its collection to the starting line – often with prominent drivers sitting at the wheel. For instance, the Swedish King Carl XVI Gustav started together with Leopold Prinz von Bayern in a BMW 328 Touring Roadster during the new version of the Mille Miglia, held as a consistency run. In 2004, a special success was added to the more than 200 racing victories achieved up into the 50’s with the BMW 328. With the 1940 victory vehicle, Giuliano Cane managed together with his co-driver and wife Lucia Galliani the feat of winning the Mille Miglia even under the new regulations. Since then, the BMW 328 Mille Miglia Touring Coupe is the first vehicle that could roll over the finish line as the victor in both the classical races as well as in the new version of the Mille Miglia. In the BMW Concept Coupe study Mille Miglia 2006, the heritage of a successful motor sports history is unified with the technical expertise of the present and the fascinating perspectives offered by the future. The unique specimen fabricated on the occasion of the Mille Miglia 2006 is a spectacular proof of how closely historic values, current competence and visionary power are related with each other in the BMW Group. Turning one’s mind back to the product and brand history is a permanent process. The values and principles that have distinguished the history of the BMW Group continue to provide important impulses for the company’s power of innovation even today. The corporate division BMW Group Mobile Tradition was especially created to ensure the best possible handling of the valuable heritage. All activities concerning the history of the BMW Group worldwide have been coordinated there since 1994. The mission of the Mobile Tradition is to keep the company history and its products alive, to groom them and to make them accessible to the public. The BMW Group Mobile Tradition is considered the soul and memory of the company. That includes inactive brands along with the active ones and attention is not only turned to the BMW brand. The absorbed brands Dixi and Glas also find consideration. Along with MINI, the Riley and Triumph brands also take their places. On top of that, grooming the Rolls-Royce brand was added in 2003. The heart of Mobile Tradition is the historic collection. Its storehouse comprises over 400 automobiles and 170 motorcycles as well as a number of aircraft, motorcycle and automobile engines. Its exhibits provide a cross-section through the product history from the founding of the company in 1916 up to today. Over and above the static presentation, Mobile Tradition, fitting to its name, also ensures presence during domestic and international events like the Concorso d’Eleganza Villa d’Este and the Mille Miglia. Vehicles from the historic collection are sent every year to hundreds of events – as rolling ambassadors of a fascinating history. The gap between the past, present and future is impressively bridged, just as in the BMW Museum. The museum, located next to the corporate headquarter, is one of the best-visited facilities of its kind. The history of mobility is made tangible there not only using permanent pieces but also with alternating special exhibitions. After extensive renovation, reconstruction and expansion, the BMW Museum will be reopened in the summer of 2007. The systematic and scientific preparation and organization of documents is pursued in the BMW Group’s historic archives. Documents, leaflets, photographs, operating instructions, publications and trophies are kept available in this collection. For historians, journalists, authors and owners of historic automobiles, this is an inexhaustible source of knowledge not only about products from the BMW Group but also about the history of the company and the personalities who defined it. A IV system developed especially for the historic archive facilitates computerized access to the information sought. For owners of historic vehicles, the BMW Group Mobile Tradition is a dependable contact for maintenance, grooming and repair of their automotive treasures. Service and parts sales support old-timer friends throughout the world in professionally maintaining their vehicles. Experienced experts provide individual advice to customers and dealers. A parts catalogue, also available electronically, eases selecting the required items. Thanks to highly developed logistics, fast provision of all products is ensured. The BMW Group Mobile Tradition also controls the remanufacture of parts that would otherwise no longer be available. The fascination exuding from current and historic vehicles from the BMW Group is also reflected in the community spirit that brings fans together with the brand. Worldwide, more than 180 BMW clubs note over 250,000 members. The BMW club organization is the largest in the world in the entire sector. Their members see themselves as ambassadors of the brand and preservers of the BMW tradition. BMW Group Mobile Tradition supports these clubs in preparing and disseminating information. They are provided with all the important facts and data through the Council of BMW Clubs and the international umbrella organizations. The BMW Clubs act as important partners for market information for providing parts for historic vehicles.